texte de la pétition: Tell Senate Democrats: Stand United Against Trump's Supreme Court Pick. 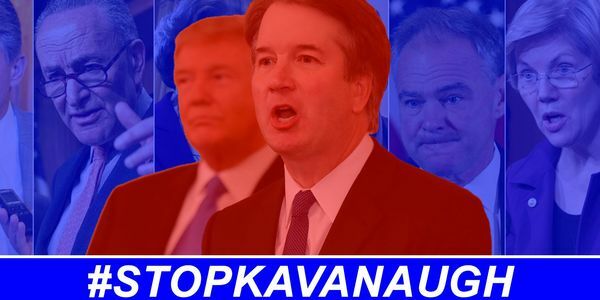 Stop Kavanaugh! Tell Senate Democrats: Stand United Against Trump's Supreme Court Pick. Stop Kavanaugh! The President of the United States is under investigation for how he won the election (among other things). He has already pushed through a Supreme Court nomination that was stolen from his predecessor, President Obama. Another extreme right Justice could upend Americans' rights for generations to come. These are just a few of the reasons that Senate Democrats must stand united in rejecting President Trump's nomination of Brett Kavanaugh to the Supreme Court. If Democrats all oppose Kavanaugh, it will only take one or two Republicans to stop him — and potentially delay the pick until after the 2018 elections. But if even one Democrat supports Trump's pick, hope for saving the Court is lost. Please add your name to the below letter, urging all Democratic Senators to stand united in opposition to Judge Kavanaugh. We write to urge you in the strongest possible terms to oppose President Trump's nomination of Judge Brett Kavanaugh to the Supreme Court. Prior to his judicial appointment by President George W. Bush, Kavanaugh was a Republican operative, a key player in the impeachment of President Clinton and a senior official in the disastrous Bush presidency. He has spent his career opposing every value that we, as Democrats, hold dear. As a Justice, he is likely to spend decades reversing progress on women's rights, Civil Rights, voting rights, and workers rights — all while giving more power to entrenched wealth and multi-national corporations. We believe his nomination is unacceptable and consider any Democrat's support for him to be an unforgivable sin. We understand that political considerations factor in to your decisions, but to be frank, this is what you were elected to do. Please stand up against Trump's attempt to reshape the court in his image for a generation. Stand united with your fellow Democrats and the values you claim to represent. Oppose Trump's nomination of Brett Kavanaugh's to the Supreme Court.